When I'm feeling like ooey-gooey warm chocolate, but I don't have anything in the house that quite fits the bill, enter my trusty Betty Crocker cookbook , stained and wrinkled page 140! Hot Fudge Sundae Cake always comes to the rescue! I've been making this Hot Fudge Sundae Cake for years. And before that, I remember my mom making it many, many times. Made with ingredients that I always have in the pantry,the Hot Fudge Sundae Cake can fulfill my chocolate longing in about an hour! 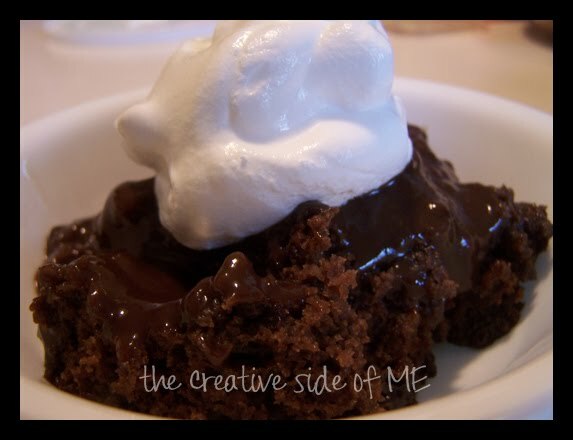 A quick and fudgy cake that is perfect for these cooler days! Ice cream, whipped cream, or cool whip, if desired. Mix flour, granulated sugar, 2 tablespoons cocoa, baking powder, and salt in ungreased square 9x9x2 baking dish. Mix in milk, oil, and vanilla with fork until smooth. Stir in nuts. Spread evenly in pan. In a small bowl combine brown sugar and 1/4 cup cocoa. Sprinkle over batter. Pour hot water over batter. Bake 40 minutes or until top is dry. Spoon warm cake into dessert dishes. Spoon sauce from pan onto each serving. Top with ice cream or cool whip, if desired. Oh my gosh! That looks so good... it's so naughty of you to show me that. LOL.